I saw this on Stephanie's blog a few days ago and immediately wanted to borrow it! Let me know if you do too. Hark the Herald Angels Sing is my very favorite but how can you pick just one? I also love O Come All Ye Faithful. As for modern Christmas songs, I really like Hope Is Born Again by Point of Grace and Welcome to Our World by Chris Rice. Q: What is your favorite Christmas special/movie? Homemade Chex mix, pecan dreams (aka mexican wedding cookies), and iced sugar cookies for Santa, and sausage balls. I usually try a few new things each year but those four are on my wouldn't-be-Christmas-without-them list. I should also mention that as of today I haven't done any holiday baking. That changes this weekend though! Gingerbread lattes from Starbucks have been high on my list this year. I always ask for decaf and half the syrup. I don't like my coffee too sweet. Usually one or two. We have one this weekend that I'm really looking forward to! Q: Do you go Christmas caroling? Does anyone carol at your house? Yes to both! In the past we've gone caroling in our neighborhood with our neighbors but the past year or two we haven't been able to join them so they've come to sing to us! John and I went last year with a group from church and we'll be doing that again this weekend! A simple wreath. I usually also hang a garland with white lights around the door frame but we didn't get that done this year. Q: When do you put your tree up and take it down? I like to get my tree up the weekend after Thanksgiving but that doesn't always happen, especially if we travel. In those cases I get it up as soon as possible! As for taking it down? I'm usually ready for it to come down the day after Christmas, much to my family's chagrin. I get a little twitchy if it's up too long. I'm a pretty traditional girl, so yes, red and green. I've never been bold enough to go for blue or purple. I do love lime green though and that adds a fun pop! Q: How many Christmas trees do you put up? ONE! If my house was bigger I might do more because I'm certain we have enough ornaments to decorate a small forest. Q: Are your Christmas decorations themed or hodgepodge? Hodge-podge and I LOVE it! Q: Ham, turkey, both, or something else for Christmas dinner? If we stay home for Christmas (and we usually do) I made a dish called Chicken Eden Isle for Christmas lunch. It's easy to make ahead of time and pop in the oven when needed, plus my family loves it, if feels fancy and decadent, and it's not something we have very often throughout the year. Q: Do you have any traditions that are unusual or out of the ordinary? Hmmmmm, unusual? I don't think so. We do the stuff most families do I think. Put together a gingerbread house, drive around and look at lights, buy gifts from The Giving Tree at church, send Christmas cards, church on Christmas Eve, etc. A few years ago, we started going to Denver on Christmas Eve Eve and having a nice dinner and walking around 16th Street Mall. That's been something new and fun for us now that our kids are older. A couple of years ago, my sister gave me a cute over-the-door-thingy that holds/displays them. I pull that out every year but this year I couldn't find it so I've been adding them to basket under my Christmas tree. I usually check our mail in the afternoon and open them first so I've been passing them around at dinner so each of us can look at and read them. I've done a number of different things over the years--saved them, put them in scrapbooks, kept them in a bowl on the kitchen table and picked a few each night and prayed over them. Typically though, I toss them. It kills me, but I'm just not a clutter girl and don't have a place to store them (we send a lot and we receive a LOT!) Please don't let that confession be the reason you take me off of your list! Q: Christmas newsletters? Love 'em or hate 'em? L-O-V-E them! You might think that in this day and age where we're all connected via social media that Christmas newsletters aren't necessary. Perhaps that's true but I love receiving them and hearing news about those we love. I let the writer in our family take care of ours each year because it wouldn't feel "enough" to me to just send a family photo. Meme credit goes to Carrie and Barbara. Thank you, ladies! Very fun that you filled this out! 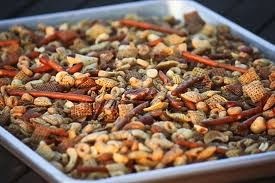 Chex Mix is usually one of my Christmas staples, but I don't know that I will get it made this year. I just can't trust myself with it in the house at all. : ) Maybe next week I'll break down and make a SMALL batch!